where $p_t^A$ and $p_t^B$ represent the prices of stocks $A$ and $B$ at time $t$, respectively, and $\gamma$ is the cointegration coefficient. When using these log prices, Vidyamurthy uses the cointegration coefficient ($\gamma$) to indicate the ratio of shares to hold rather than market values of positions (as stated should be the case here, for example). What is the correct practical interpretation of $\gamma$ when cointegrating log prices, should it represent the ratio of shares or the ratio of market values? If the latter, why does Vidyamurthy use the former interpretation throughout his book? Could both be valid? Firstly i think if you use log prices then γ shows by how much B stock growth rate outpaces A stock growth rate, but I don't understand why Ernie says that you need to hold market values fixed, if you do this then how are you going to profit from the spread? Secondly there are typos in the return calculation: log(20.1)-log(19.5) = 0.03 not 0.3. Which refers to the 3% return on the A leg trade. B leg return is indeed 5.6% (assuming cc returns), however it is incorrect to sum these return to get 9% return on the total trade, since they were obtained from different amounts of capital. The return from A leg is 0.6USD and return from B leg is 0.29USD*1.5 = 0.435USD thus the total return is 1.035USD which we divide by the total capital deployed in the trade at time t, 19.5+1.5*7.46 = 30.69$, so 1.035/30.69 = 0.0337 and this is the real return on this trade, not 9%. It should mean market values (instead of shares). 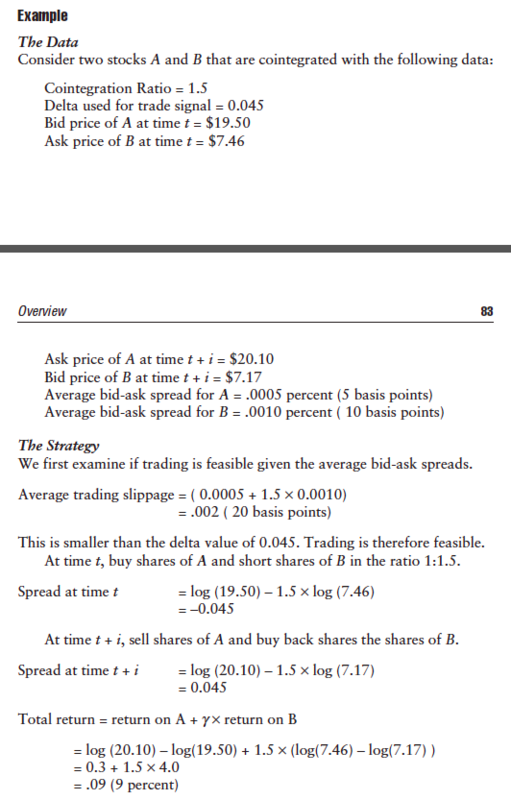 You can see this more obviously by creating an "artificial stock" (stock C) which price equals the price of stock B divided by 10,000 (same fluctuation rate, but just much smaller absolute price). Now the co integration coefficient would not change because C and B have the same variation rate (it would only affect the intercept, mu). If the cointegration coefficient means the shares ratio, then it would not make sense because now C occupy too little of your portfolio. It would only make sense as market values.